The blood clot that has put Secretary of State Hillary Rodham Clinton in the hospital is probably in her leg and is most likely a consequence of resting after the concussion she suffered from fainting 21 / 2 weeks ago. 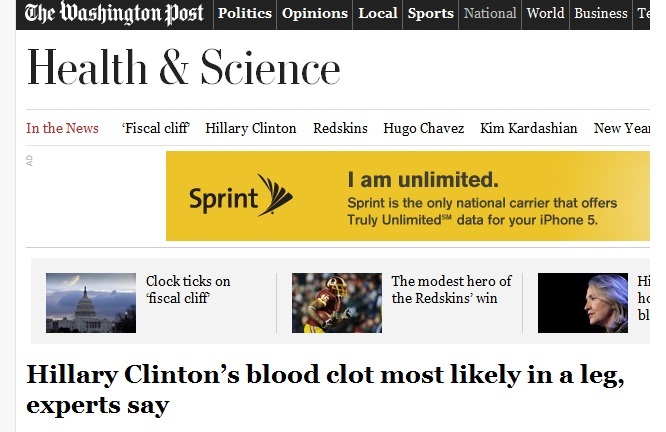 By 5PM, doctors had revealed that the clot is in fact in her head. surveys of voters leaving the polls last month showed that support for the Tea Party had dropped precipitously from 2010, when a wave of recession-fueled anger over bailouts, federal spending, and the healthcare overhaul won the Republicans a majority in the House. Above is what's widely considered as the crystallizing moment of the Tea Party, with the financial news channel CNBC's Rick Santelli leading highly paid Chicago securities traders in a rant against relief on negative equity mortgages -- the kind of thing that a post-property crash economy might need. The Tea Party as a political movement -- as opposed to it being the latest manifestation of the paranoid strain in American politics -- always had more to do with the preferences of the economic and financial elite than one particular set of policies. With conservatives again circulating a CNBC video clip to rally the cause, this time of Maria Bartiromo supposedly winning an argument with a Democratic senator over the fiscal cliff, bear in mind CNBC's core constituency and thus the credibility of any "populist" credentials emerging from it. We have a mental health system in this country that has completely and totally collapsed. We have no national database of these lunatics. 23 states, my ... however long ago was Virginia Tech? 23 states are still putting only a small number of records into the system. And a lot of states are putting none. So, when they go through the national instant check system, and they go to try to screen out one of those lunatics, the records are not even in the system. I talked to a police officer the other day. He said, "Wayne," he said, "let me tell you this. Every police officer walking the street knows s lunatic that's out there, some mentally disturbed person that ought to be in an institution, is out walking the street because they dealt with the institutional side. They didn't want mentally ill in institutions. So they put them all back on the streets. And then nobody thought what happens when you put all these mentally ill people back on the streets, and what happens when they start taking their medicine." We have a completely cracked mentally ill system that's got these monsters walking the streets. Now he'll say he's only talking about the actual spree killers of the world but since we only find who the spree killers are after the fact, his preferred world is one where anyone with mental illness should be committed, if necessary against their will, and even in treatment cannot be considered to safe enough to walk the streets. It's remarkable that the NRA has managed to select its oft-boasted 4 million members without any of them having a friend or relative who would be subject to such restrictions. The prestigious university proves that the smartest people do the dumbest things: It has hired an atheist chaplain. Hired in July by the Humanist Community at Stanford, a nonprofit group independent of the university, Figdor is one of 18 "professional leaders" at the Office of Religious Life who typically work with sectarian student groups that pay their salaries. A graduate theological degree is required for the job, and the leader is entitled to office space on campus, a parking spot and a Stanford e-mail address. The leaders guide students in whatever way is needed, whether offering advice or organizing events. 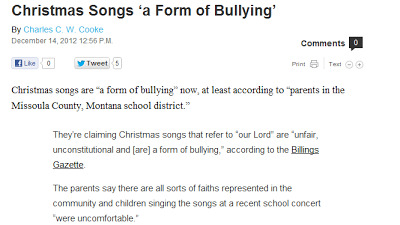 But in what's been a thin War on Christmas, it was too good a non-story to pass up. When is a lobby group not a lobby group? Answer: when it's the National Rifle Association. The above is clipped from the NRA's 2010 disclosure (Form 990) as a tax-exempt entity, and it reports zero dollars spent on lobbying. It does spend large amounts on its own salaries (Wayne LaPierre shows as receiving $960,000 in compensation in 2010), consulting firms, and various services related to stirring rage among its members about dark plots to take away their guns. They are not, yet, as fussy about the lobbying distinction as they are about the difference between automatic and semi-automatic weapons. With its melding of themes of rebellion and gun culture, Green Day's Last of the American Girls probably wouldn't survive a National Rifle Association popular entertainment cull. Luckily, Green Day and its video characters are clearly sane compared to the NRA. And does anybody really believe that the next Adam Lanza isn't planning his attack on a school he's already identified at this very moment? Several Middle Eastern traders said they had been approached by small UAE-based companies offering a type of fuel oil dubbed in the market as "Iraqi special blend" that included a combination of different fuel oil blends from the Middle East, or with an origin described as Iraqi. The specification indicates this is a cocktail of products blended in storage tanks and usually offered from the quiet Gulf port of Hamriyah and bunkering hub Fujairah mostly via ship-to-ship transfers (STS), trading sources said. "This Iranian fuel oil, disguised as Iraqi origin, has been flooding the market in Fujairah and depressing both cargo and bunker premiums in September," said a Middle East-based trader. The Board found that there was a tendency on the part of policy, security and other U.S. government officials to rely heavily on the probability of warning intelligence and on the absence of specific threat information. The result was possibly to overlook the usefulness of taking a hard look at accumulated, sometimes circumstantial information, and instead to fail to appreciate threats and understand trends, particularly based on increased violence and the targeting of foreign diplomats and international organizations in Benghazi. The dots were, and are, still not being connected. 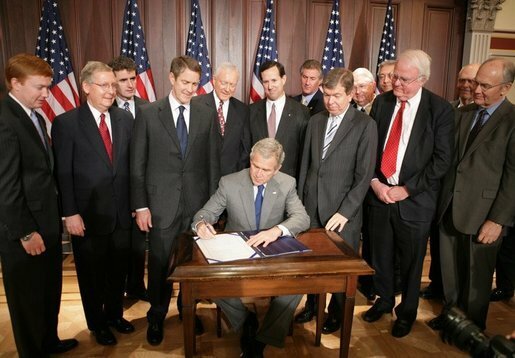 The photo shows George Bush signing the portentously named but no less pernicious Protection of Lawful Commerce in Arms Bill of 2005. The law gave the gun industry -- manufacturers, distributors, dealers, and trade associations -- blanket immunity from civil legal actions intended to hold them accountable for having maximized the availability of guns, regardless of consequences. For current political purposes, note Senate Minority Leader Mitch McConnell smirking as the bill is signed. 2005 was probably the peak of the Bush madness --he's been reelected and Iraq was not yet obviously a disaster -- but we're still stuck with the legislation rammed through in those political bubble years. In the media coverage of the Newtown massacre, there's an understandable focus on the number of children killed. As there should be. There's not enough focus on how this is yet another attack by the decentralized network of spree killers with a disproportionate number of female casualties, but that's for another day. The above picture is of Christine Greene, who was murdered aged 9. A neighbour had taken her to see a public meeting of Arizona Congresswoman Gabrielle Giffords when the event was attacked by Jared Loughner. Just a reminder that we've had child victims of the spree killer network -- and its support infrastructure -- before last Friday. I am doubtful that these reforms would do much to curb gun violence. An “assault weapon” fires at the same rate as an ordinary semiautomatic rifle, and the .223-caliber ammo in Lanza’s rifle is banned for deer hunting in some states on the grounds that it’s too weak. High-capacity magazines sometimes stop shootings by jamming, and shooters are often (though not always) able to change magazines without incident. This is a masterpiece of faux concern and faux passivity. Larger magazines help stop spree killers because they might jam! Spree killers aren't even using the biggest bullets they could use! Taking together with his previous post, note the worldview that the environment under which citizens can -- to use the recent examples of where the decentralized network of spree killers has struck -- meet their elected representatives, go to school, church, or shop, should be determined in part by whatever minimizes the effort on the part of animal hunters. UPDATE: More on this very strange person from Slate. July 2012 (Aurora Colo. masssacre): In the process, his crime has probably also solidified the Batman movies' status as a cultural touchstone for our era of anxiety. Every human society has feared the anarchic, the nihilistic, the inexplicably depraved. But from the Columbine murderers to the post-9/11 anthrax killer, from the Virginia Tech shooter to Jared Lee Loughner, our contemporary iconography of evil is increasingly dominated by figures who seem to have stepped out of Nolan's take on the DC Comics universe: world-burners, meticulous madmen, terrorists without a cause. March 2012: No, this was where the Tebow story was always destined to end up. Denver was his Galilee; New York will be the Roman Colosseum. Or to be pop cultural rather than scriptural: Denver was District 12 in Suzanne Collins’s Panem, and the Meadowlands will be the Hunger Games arena. 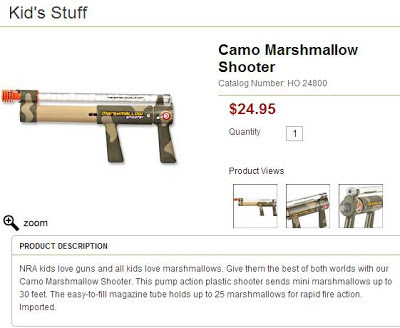 National Rifle Association website, retail area. In hunting, a semiautomatic gun reduces the recovery time between shots, which is especially helpful during drives, when the targets are running. There are many possible points of discussion of the Newtown, Conn. massacre. One is the possibility that the sequence of spree killers are competing with each other: the bar for outrage is being raised with each attack. A high school. A mosque. A temple. A congresswoman. A shopping mall. A cinema. And now an elementary school. And each one with a supportive infrastructure of information, money, and access to guns and tactical equipment to support the raising of the bar next time. Didn't we just have a big debate about whether and how long it took to refer to the Benghazi consulate attack as terrorism? Yet the word "tragedy" is preferred for what is clearly a decentralized and competitive terror network operating within the country. On Friday December 14, 2012, Charles Cooke at National Review's the Corner sees a big problem in an American classroom. 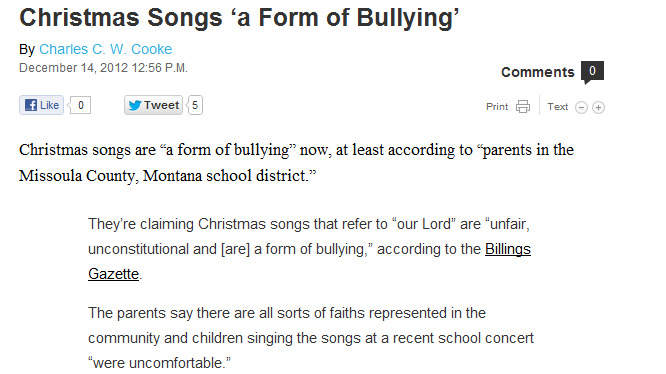 The problem being complaints about Christmas carols being sung in school. Tell that to the parents in Connecticut. In giving meaning to the words in her [Secretary of State for NI] statement, that nobody can be in any doubt about the Government’s support for the Union and its flag, will she go to Northern Ireland at her earliest convenience and reiterate again and again the view that Ulster’s Britishness is not diminished whatsoever? This is the perception in Syria, where everything that people said would happen if we did not intervene has now happened because we have not intervened -- growing radicalization, sectarian conflict, the collapse of the state, and now the spectre of chemical or biological weapons being used. Note that his list of supposed consequences of the US not intervening in Syria describes exactly, in reverse order, the results of the McCain-supported US intervention in Iraq. 1. So complicated to engineer, only the Iranians could be helping Al Qaeda do it. 2. Technique so generally known that Syrian insurgents could be teaching themselves. 3. So simple, even the Irish can do it. Or else, if phase 1 is reinstated, we have Hezbollah-on-the-Foyle. 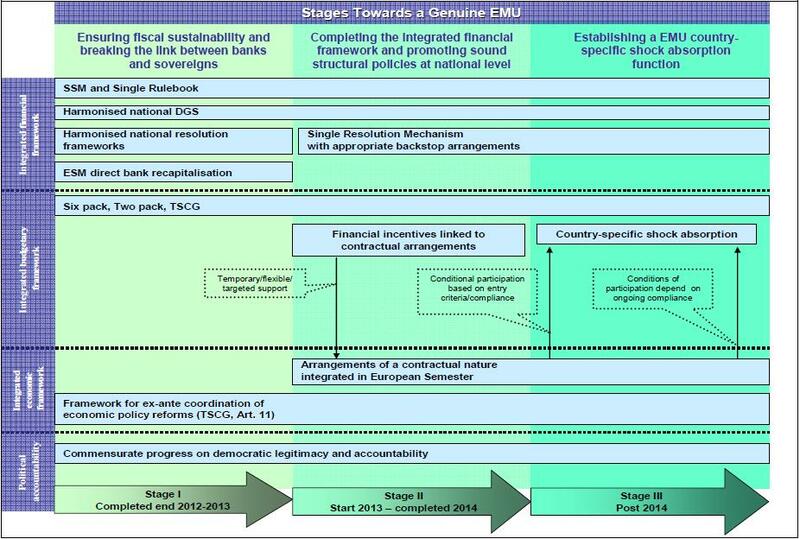 The summary diagram above is from a document issued yesterday by European Council President Herman van Rompuy, Towards a Genuine Economic and Monetary Union -- a title that will come as news to those who thought they'd signed up to EMU in the 1990s. 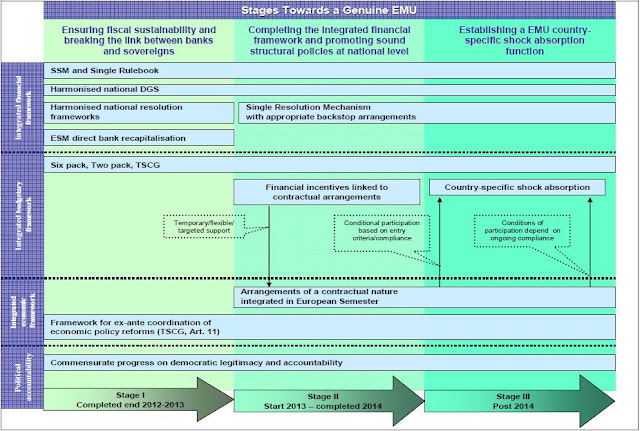 Anyway, among the revealing things about the diagram is that as it moves from top to bottom, from actions in areas of finance, budget, economics, to political accountability, it gets less specified, to the point where the accountability line calls only for "commensurate progress": there are no specific actions at all. Maybe after they're done getting us to genuine EMU, they'll work on that accountability thingy.